Not every room in your home is ideal for the placement of an Oriental rug, yet with the right atmosphere, and accompanying pieces, it can cheer up a living space dramatically if done correctly. In fact, some areas may be perfectly suited for the addition even if there is currently wall-to-wall carpeting occupying the space, and especially if you are considering removing the carpet to have tile or hardwood flooring installed. However, finding a rug which compliments your décor, while exhibiting your own individual tastes, is not something to be taken lightly, so Ahdoot is here to offer a few tips on selecting a rug that is guaranteed to satisfy its owner. Oriental rugs add warmth to a room, both literally, particularly in the case of tile which at times has the tendency to be cool to the touch throughout the year, and aesthetically, as it can enliven an otherwise bland décor with its vibrant style and boldly-colored flair. But first, let’s approach the existing flooring in the room you’re wishing to add an Oriental rug to. Is the flooring something you would rather hide beneath the rug itself, or would you more readily have the rug serve as a centerpiece to an already-stunning hardwood or tile floor? If you’d prefer the rug cover the area completely then the solution is simple: purchase a rug which spans the entire length and width of the room as much as possible. Commonly, the flooring at the edges of a room is in the best shape anyway, so even if there is a somewhat sizeable gap between the walls and the rug’s placement, you will likely see the rug as a complementary addition to the room. However, if your Oriental rug is going to be part an overall design choice, and your flooring is too beautiful to conceal beneath it, choosing a carpet which adequately covers the portion of the room you want to emphasize, without overburdening the flooring by your rug’s scale, is a decorating best practice. Also, leave room for decision-making down the road, never assuming you will want to keep the décor laid out the same way for years to come. Even if you plan on leaving your wall-to-wall carpeting in the room you want to supplement with an Oriental rug, there are ways to make it work to your decorating advantage. Many of our customers have found that simply hanging a rug on the wall as an art piece gives a room depth and a meaningful point of discussion when guests are present. Realistically, it again comes down to how much space you want to cover, and how much wall space you’re working with, in determining what will work for you. 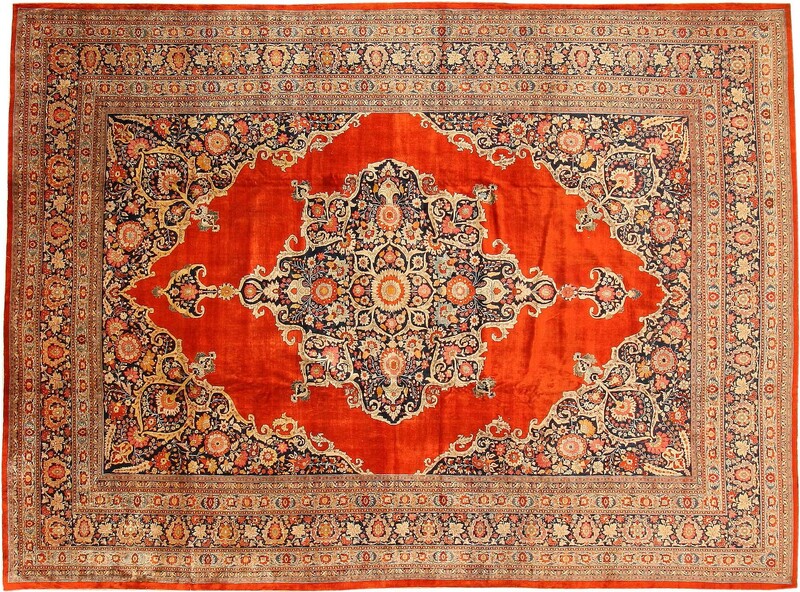 As a rule, most decorators avoid putting Oriental rugs on walls which are perpendicular to seating, preferring instead to install them either as a focal point in full-view of the homeowner, or as a backdrop that serves to accent a room’s color and design scheme. Following similar guidelines as those found above, you should be able to create a striking ambiance to your living room, family room or den in no time. Lastly, and perhaps more importantly, a rug should add to a room without overpowering it. While there is a subtle art involved in designing a room, even those who might consider themselves amateurs can express their personal tastes through their Oriental rug by bringing home a rug fitting for their living space. If you’re trying to make a space appear larger, using bolder patterns, such as large floral motifs, abstract designs, and multi-layered colors, can entertain the eye and seemingly draw it away from the borders of the room. However, adding too many pieces of furniture on top of the rug can dampen this effect, so it’s best to avoid obscuring the design with too much seating, end tables and coffee tables. In larger rooms, while there is more space to work with, a rug can either suffer being hidden by other pieces of décor, or can sometimes make the room feel too spacious, which may give guests and homeowners a sense of separation and isolation. One way to combat this is by being consistent with the way furniture is arranged atop the Oriental rug, making certain to allow the rug itself to be admired, without creating too much space between seating. Live by the rule: less is more and you should have no issue complementing the area with your purchase. And finally, when selecting an Oriental rug, be sure to choose something that explores the depths of your personal tastes without stepping over the line of proper judgment. A carpet’s color and design should be confident, yet understated to a degree, and may ultimately create opportunities to further add to the existing décor of a room by introducing new colors to the area. Don’t be afraid to inject a bit of playfulness into your home, and by all means enjoy the experience.